Durability and dead-on accuracy have made Troy Industries M4 Style Folding BattleSights the hands-down choice of Special Ops and tactical users worldwide. A push of a button folds the sights securely out of the way until you need them again (they fold to a profile of just 0.460). Troy BattleSights feature a zero-canting attachment system for use on all military and aftermarket receivers. No tools required for adjustment. Each click adjusts .50 MOA. Also, these sights are available with option Tritium Illumination! 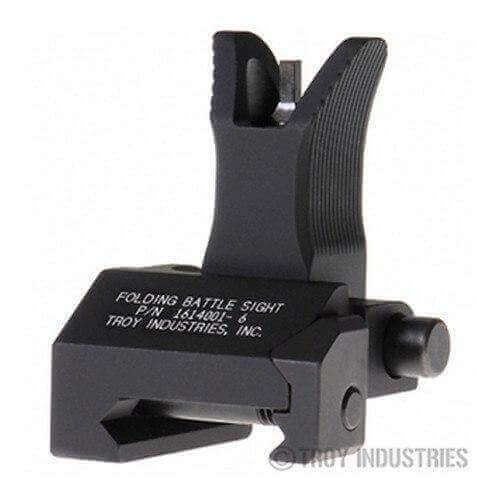 Troy Industries’ TRITIUM BattleSights are designed for twilight or any low-light situation. TRITIUM is a form of hydrogen that emits a continuous light source where using batteries or electricity is not possible. The front post is centered between two Tritium points of reference to allow proper alignment, eliminating the poor sight orientation that is typical in twilight. Just because the light’s not perfect doesn’t mean your aim shouldn’t be.